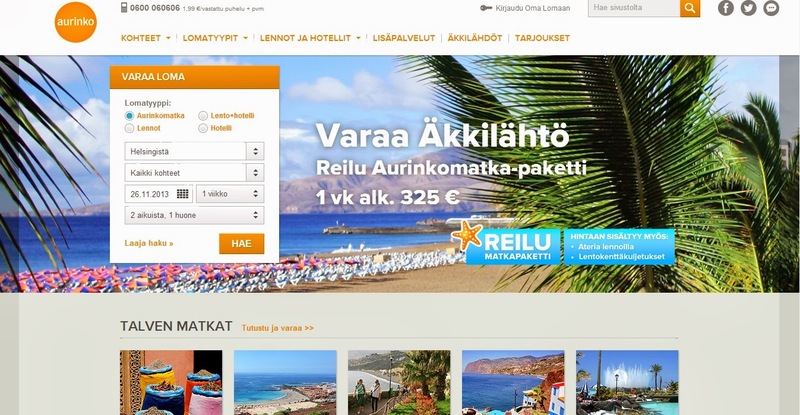 Aurinko´s website looks like a combination of a catalogue and a selling platform. On the main page the difference between upper part and the bottom part is noticeable. 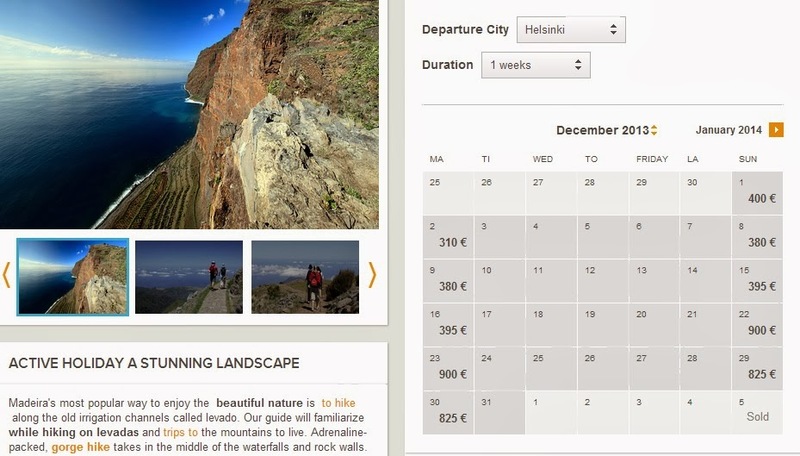 The upper part is the catalogue, which provides the picture, name and price of the destination, and the bottom part looks like the selling part, which provides the information on the prices, newsletter section etc. Aurinko does not have any specific colors that they try to concentrate on, even though the pictures that they use are mostly of sea destinations (which all are dark blue). The background is a standard grey color which objective is to point out the pictures. After seeing other websites, it is somehow confusing, and does not give the idea of something more luxurious and original. The Social Media Sites that Aurinko is promoting on the WebPage are Facebook (163 660 likes), Twitter (626 followers) and their personal blog. On the blog, at the bottom of the page they also promote their Youtube Channel (70 subscribers and 386.787 video views) – and on the Youtube Channel apart from Facebook and Twitter they also promote Pinterest and Google+. Aurinko is active on all of their social media channels, even if they do not have many followers, it is clear that they are in an active process of promoting theirselves and trying to attract new followers and users. In general the site is very easy to navigate; you are never going to get lost on it. It is easy to book the trips, as the booking box is easy to understand and use; each destination has a file card description of it, it is also possible to see from the beginning the prices for the holiday depending on the week that you choose. To conclude, the site is functional, easy to understand, does not provide too much information from the beginning, only when you choose the destination. It is not good connected with the other Social Media sites that they have and they do not have many followers (even though, aurinko is very active on SoMe). Lomamatkat does not have physical agency. Their website from the beginning looks like a well planned booking platform, you can see prices of the holiday destination you are choosing, you can see the functional description of the hotels that are available in the destination and you can easily find the botton to book it. Everything leads to booking bottons. The color of the website is blue and white, but the pictures of the destinations are very different and do not have a specific theme or color. The background is similar to that of Apollo, where from the beginning you see the sea, and scrolling down you get onto the sand. In general the template is standard, but a little bit out of date. there are also pages where the text is not well fitted into the cells. The Social Media sites they promoted at the bottom of the main page are: Facebook (41 167 likes), Twitter (65 followers) and Google+. All the companies operate on the internet and internet sales and promotion are the most important nowadays. The way you brand yourself on internet is how your clients and potential customers are going to see you in the future. Some of them are more active on the Social Media Sites than others, some have invested more time in developing a nice, original website and effective sales platform. Important: The webpages have been visited and the information collected in November 2013.